This MiJET standalone unit has an ergonomically designed angled opening that creates easy access for cleaning exta wide parts. This unit is powered by air, is used near CNC machines or inspection stations to clean oily residue and chips from parts, then captures that residue with vacuum into a container for recycling. A specially designed, patent pending valve allows an operator to pull the trigger on an air nozzle which simultaneously actuates both an air jet and suction. The air jet allows localized cleaning of parts, while the suction pulls the atomized fluid particles and chip residue downward into a removable container below. Captures coolant and chips when blowing off parts … it doesn't end up on your equipment, floors, facility, or operators! Reduces cleaning expense and time. Reduces slips, trips, and falls. Allows cursory inspection of clean parts. Allows recycling of expensive lubricant. Improves inside air quality to help meet OSHA and NIOSH limits on airborne mist. Ready to use with one existing air line. Includes Prevost OSHA compliant air nozzle and 13 ft. spiral hose with swivel end fitting. Portable for more than one application. While holding the MiJET™ air nozzle above inlet pipe, pulling the trigger drives air to blow residue off a part. 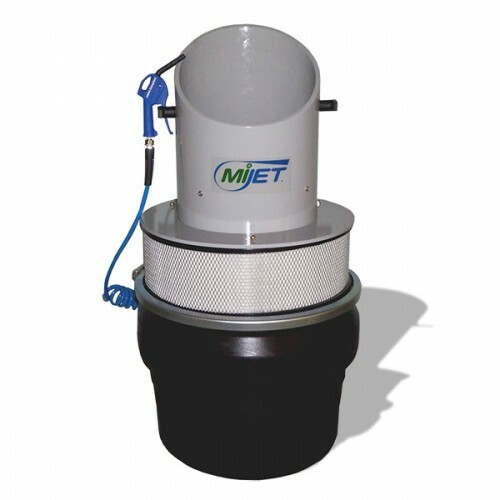 Simultaneously, the MiJET™ creates suction, pulling lubricant, chips, and air downward, capturing the residue. Exhaust air is filtered before exiting MiJET™. Height: 40 in., Diameter: 22 in.